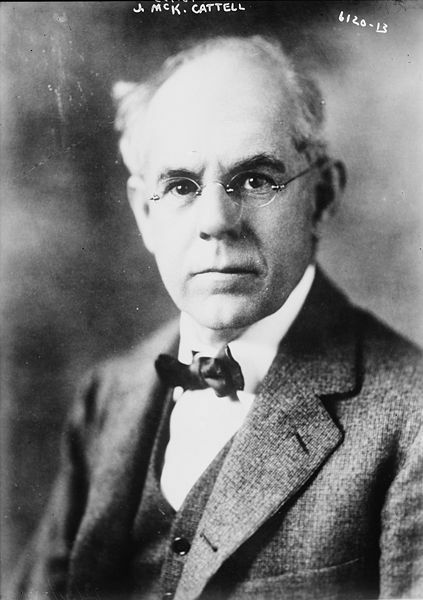 James McKeen Cattell was the first psychology professor in the United States, teaching at the University of Pennsylvania. During those early days, psychology was often regarded as a lesser science and was often even viewed as a pseudoscience. Cattell is credited with helping established psychology's legitimacy as a science thanks to his focus on quantitative methods. He was also the founder and editor of a number of scientific journals including The Psychological Review. James McKeen Cattell was born May 25, 1860, in Easton, Pennsylvania. James McKeen Cattell was the oldest child born to a wealthy family in Pennsylvania. His father, William, was a Presbyterian minister who later became the president of Easton College. His uncle was Alexander Gilmore Cattell, a U.S. Senator for New Jersey. Cattell attended Lafayette College starting at age 16 where he studied English literature. He later graduated with an M.A. degree. After visiting Germany for graduate study, Cattell met Wilhelm Wundt and developed an interest in psychology. After a brief stint studying at John Hopkins University, Cattell returned to Germany to serve as Wundt's assistant. Cattell went on to publish the first psychology dissertation by an American. Cattell was awarded his Ph.D. in 1886 and became a lecturer at the University of Cambridge. He returned to the United States to teach psychology at the University of Pennsylvania and later at Columbia University. In 1895, he became the President of the American Psychological Association. Cattell was later fired from his position at Columbia over his public opposition to U.S. involvement in World War I. He later won a lawsuit against the university and, with the money he was awarded by courts, founded the Psychological Corporation with Edward L. Thorndike and Robert S. Woodworth. The corporation was one of the largest creators and administrators of mental tests. "In the struggle for existence that obtains among the sciences psychology is continually gaining ground.... The academic growth of psychology in American during the past few years is almost without precedent.... Psychology is a required subject in the undergraduate curriculum ..., and among university courses psychology now rivals the other leading sciences in the number of students attracted and in the amount of original work accomplished." Cattell was also fundamental in establishing several major psychology journals including The Psychological Review, the Journal of Science and Popular Science Monthly, which later went on to become Popular Science. Cattell, J. M. (1890). Mental tests and measurements. Mind, 15, 373-380. Cattell, J. M. (1903). Statistics of American psychologists. American Journal of Psychology. Cattell, J. M. (1896). Address of the president before the American Psychological Association, 1895. Psychological Review, 3 (2), 1-15. Cattell, James McKeen in Venn, J. & J. A., Alumni Cantabrigienses, Cambridge University Press, 10 vols, 1922-1958. Grolier Multimedia Encyclopedia (1995) Grolier Electronic Publishing, Inc.